Christmas is one of my favourite holidays during the year. When I was a little girl as soon as Halloween was over we would start to decorate the house for Christmas. Now while I don't start quite that early anymore, I do start reading Christmas books in early November to our children. This year we were lucky to have a new Christmas book to read! 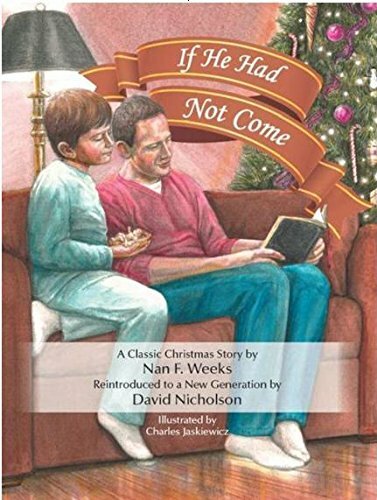 We received a copy of If He Had Not Come rewritten by David Nicholson. David Nicholson is a retired teacher and missionary. He discovered the story If He Had Not Come by Nan Weeks when his own children were little. He read this sweet story to his children for years then decided to reintroduce this story for children to enjoy again. I received a large and beautiful hard cover copy of If He Had Not Come. This Christmas story is intended for children ages 6 and up so that it can spur some interesting and deeper discussions. The book has quite a bit of text on each page along with beautiful vintage style illustrations. The story starts out with a little boy named Bobby listening to his father read the book of John in the Bible on Christmas Eve. One phrase sticks in Bobby's mind from the reading as he goes to bed. "If I had not come..."
Not long after going to sleep Bobby is awoken by a voice calling his name. He thinks it is his father calling him to get up on Christmas morning. As Bobby goes down stairs he is shocked to see all the Christmas decorations are gone, there is no tree, no presents. He hears a nearby factory running and wonders why are they working on Christmas day. Bobby head's over to the factory to ask why they are working. He's told to go away and know one there knows what Christmas is! While Bobby is looking around town he finds an elderly man who isn't well. He tries to go to the hospital to find him help, only to find the hospital isn't there! He then tries the homeless shelter and it's gone to, so is the church. Each place he visits he finds signs saying "If I had not come". Feeling so confused he decides to go home to ask his parents for help. When he gets home he picks up the Bible his father was reading to him the night before. He find's that all the pages past the book of Malachi are empty! All the pages have faint printing of "If I had not come". How stunned Bobby was to find all the things that had been connected to his Church have disappeared. Then Bobby wakes up on Christmas morning hearing the church bells and he is so happy, he had only been dreaming! I read If He Had Not Come to my children ages 5, 7, 9,10 and 12. Although the book is suggested for children age 6 and over, my 5 year old really enjoyed it. Now he will be 6 soon though. Our children loved the beautiful images in the story. They loved to follow along with little Bobby as he explored his town. They all wondered what happened, was Bobby dreaming? The book brought up a lot of discussion topics about why we celebrate Christmas and what life could be like if Jesus had not been born. The younger children thought of it as a nice story about how they should appreciate what they have and are thankful that Jesus came to save them. Our older children naturally had a deeper connection. They can better recognize all of the things around them that are funded and supported by Christian church groups. How would their lives be different without these? How very different would our lives be if Jesus had not been born to save us. At the back of the book are some helpful extras. The first is interactive topic starters. These would be great for Sunday Schools and we enjoyed using them as well. I picked a few questions to talk about each time we read the story. Then there is a section called Going Deeper. This has discussion questions that would be best suited to older children. Some of the topics are thinking about all the things today that were started by Christian groups that might not exist if Christ had not come. The Salvation Army, Habitat for Humanity etc. Then there is a page that shares God's gift of salvation message and guides you through the steps of admitting sin, believing Jesus and confessing your faith. At the end, there is a simple craft idea to go along with the story. It shows how a Christmas tree represents the story of Jesus. We haven't done this yet, but plan to as Christmas gets a little closer. This has become a must have in our Christmas collection and I'm looking forward to reading it with our children each year. It will be one we treasure to share with our Grandchildren some day as well.